Webb County (3,376 sq miles) is in south Texas and borders Mexico. The county has garnered headlines as part of the Eagle Ford shale play. 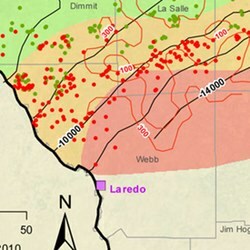 Webb county is a legacy producing area that produces natural gas from the Lobo and Wilcox formations. Webb County is now targeted for the liquids-rich nature of the Eagle Ford formation in the northern parts of the county. Much of the county will be prospective for shale gas or simply dry gas as natural gas prices may improve above the $4 level. The county is part of the southern extreme of the play that borders Mexico. Activity in the county is focused in northwest portion of the county where wells produce rich gas and the formation is found at depths of 8,000 ft to 10,000 ft.
County services of interest to oil and gas lease owners include the Webb County Appraisal District (tax collector) office and the Webb County Clerk (property records) office. The county seat is the town of Laredo. Other towns in Webb County include El Cenizo and Rio Bravo. Join the Webb County Discussion Group today - your voice counts! SM Energy and Lewis Energy are the largest operators with production focused in the Eagle Ford shale in Webb County. SM Energy has both non-operated and operated acreage in the area. Anadarko operates acreage that extends into Dimmit, Maverick, and La Salle counties. SM Energy operates acreage that is centered around the northern wet gas or rich gas window of the Eagle Ford in Webb County. The company entered the area through acquisitions starting in 2007, with plans to target the Olmos formation, but activity has now shifted to the Eagle Ford Shale. Lewis Energy is partnered with BP and targets the dry gas window in central Webb County. Lewis is a major South Texas operator who leveraged its experience into the Eagle Ford shale when it drilled the company's first well in 2002. BP took a 50% stake in 80,000 acres that Lewis Energy operates in early 2010.